To enable easy starting of (larger) compressors, the compressor outlet is often equipped with an unloader valve that enables pressureless starting. When motor is up to speed, the unloader valve closes. 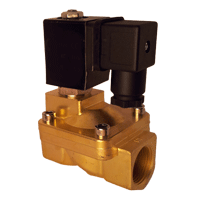 In most cases a solenoid valve is used as unloader valve. For more information, see our Unloader Valves article. During the production of compressed air, condensate accumulates. Condensate can cause blockages, corrosion and it can damage your air tools. 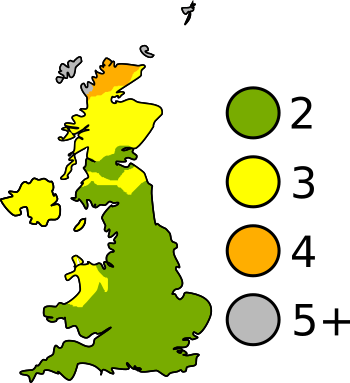 The condensate must therefore be drained in time. Automatic condensate draining is an effective and reliable solution to this problem. Solenoid Valve Shop offers several types of condensate drain systems. For more information, see our Condensate Drain article. Solenoid valves and ball valves are often used in compressed air systems. They are for example used to control actuators or the main air supply. To prevent leakage and pressure drops during the night, a solenoid valve or ball valve can be installed at the compressor output. The valve is open during the day and closed at night. The valve can be activated by for example a light switch or a timer. Solenoid valves for compressed air must have a high Kv-value to minimize the pressure drop. Indirect valves are suitable, because in general there is always sufficient pressure differential (> 0.5 bar) to function properly. In case of low pressures a semi-direct or direct valve may be better suited. Seal materials that can be used for compressed air are FKM (Viton), PTFE or NBR. EPDM is less suitable, because compressed air often contains oil. 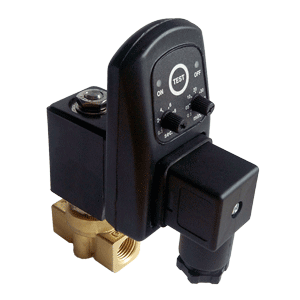 Combine the solenoid valve with a digital timer to switch the compressed air system on and off at interval times. This is an efficient way to prevent loss of valuable compressed air.